Not all of our implant cases begin like this! If you’ve made it this far, you might be wondering what dentist would be stupid enough to brag about ugly dental implants?!? You see, many dentists, us included, post our best cases where people have perfect teeth and smiles. Many other dentists actually just buy “stock photos” of “tooth models” of patients they’ve never treated (note that we don’t do that!). We dentists often assume that patients ONLY want to see those cases. 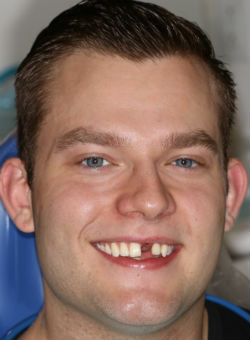 A great example we did is How Tom Got His Tooth Back. But many of our patients don’t have perfect teeth. They have older, mismatched crowns. They have staining and receded gums. They have silver fillings that date back to the Kennedy administration. On top of all that, they’re missing a tooth or teeth and just want to be able to smile again without a gap or eat their favorite foods. The patient then proceeds to receive life changing treatment with implants. They can eat again. They can smile again. They feel like they have their life back. 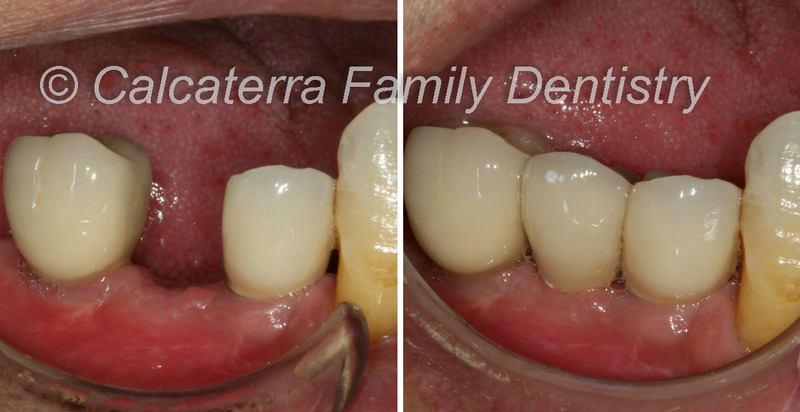 We take before and after photos, but are reluctant to post them because they don’t look like the smiling tooth models. But that ends with this post. So, without further ado, let’s look at some ugly dental implants! She didn’t have a Hollywood smile but the results are what counts! Photos and Dentistry by Dr. Nicholas Calcaterra. The patient above did not have a Hollywood smile. 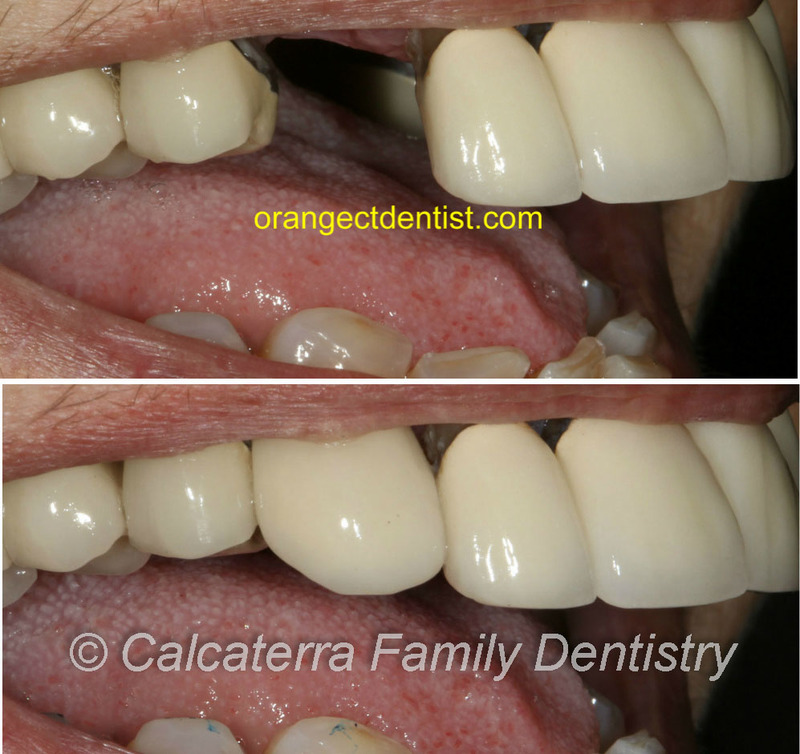 She suffered from years of gum disease resulting in gum recession, black triangles, and numerous dental crowns. Unfortunately, she had to lose her upper right canine due to dental decay. She wanted a replacement so that she could smile and eat the foods she wanted. That’s exactly what she got! A past history of gum disease did not stop this gentleman! Photos and dentistry by Dr. Nicholas Calcaterra. This gentleman is in his mid 50s. After a history of gum disease after growing up in another country, he had numerous missing teeth. He wasn’t looking to become the next Tom Cruise. All he wanted was to be able to eat his favorite foods and smile without showing a gap. It wasn’t Mission Impossible – it was Mission Accomplished! Warning! We did not treat this woman! Do you see the woman to the left? Do you actually think she is one of our patients? We only post photos of patients that we’ve treated. You’ll find dozens of before and after shots – all completed here in our office in Orange. While some may look pretty (see here and here), others don’t have the Hollywood look. But they all have one thing in common: our patients left happy because we listened to their concerns and gave them what they wanted. As usual, new patients are welcome. Visit our appointment page or call us at (203) 799-2929.